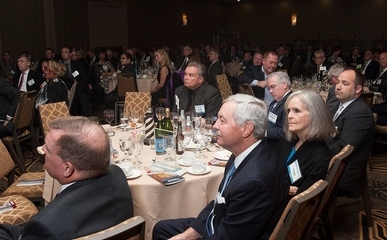 Honor healthcare supply chain excellence and recognize your colleagues, customers and peers in Bellwether League’s Hall of Fame for Healthcare Supply Chain Leadership through a Sustaining Sponsorship in a noteworthy cause for more than a decade. Our Sustaining Sponsors enjoy a variety of benefits, which vary by sponsorship level. They include promotion and visibility in Bellwether League events and media, and discounts off admission tickets to the annual Bellwether Induction Dinner Event. Place yourself and company … in great company … with great companies … supporting a great cause. Platinum Sponsors earn two complimentary admission tickets to Bellwether League’s Annual Bellwether Induction Dinner Event (BIDE). Gold Sponsors earn one complimentary admission ticket to Bellwether League’s Annual Bellwether Induction Dinner Event (BIDE). Silver Sponsors earn 50% off one admission ticket to Bellwether League’s Annual Bellwether Induction Dinner Event (BIDE). Bronze Sponsors (exclusive to hospitals, IDNs and other providers) earn $100 off one admission ticket to Bellwether League’s Annual Bellwether Induction Dinner Event (BIDE).